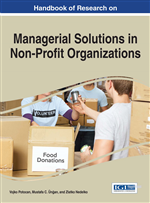 This chapter tries to contribute to the discussion about nonprofit organizations in the cash management area. The leaders of non-profit organizations are mostly concerned with their primary aim such as charity or such as the eradication of fluorocarbons. Usually, nonprofits' leaders ignore the subject of financial management. However, this ignorance may lead business failure. The cash management, which is an important subject of financial management, is vital for non-profit organizations because these organizations are usually poor in cash and their cash flow fluctuates throughout the year. The finance managers have to plan the cash flow periodically in order to pay current bills on at the appropriate time with an appropriate cost. In this chapter, the cash inflow characteristics of non-profit organizations, the basic concepts of cash flow management such as cash flow statement, cash flow budgeting, cash flow analysis based on financial ratios and cash flow problems and its possible solutions are tried to be explained. Non- profit organizations are ‘cash poor’ organizations, so managing cash flow management is very important for the survival of a nonprofit organization. The objective of cash flow management is to have enough cash to pay necessary payments at the appropriate time (Ritchie & Kolondisky, 2003). Cash flow management helps organizations to be prepared for cash surpluses and cash deficits by observing the actual and the projected cash flow of the organization (Matan & Harnett, 2012). In this part, firstly differences of non-profit organizations from profits organizations on the basis of financial management area is explained, and then the cash inflow resources of non-profit organizations are presented. Number of Days Cash on Hand: A ratio that shows how many days the organization can operate even no revenues come in. Crowd Funding Websites: The websites that let the nonprofit organization to introduce their donation programs and collect money through that page using the website’s own credit card processors. Cash Deficit: A situation where the cash outflows exceeds the cash inflows. Cash Surplus: A situation where the cash inflows exceeds the cash outflows. Current Ratio: A liquidity ratio that indicates whether the organization has enough current assets to pay its current liabilities with a margin of safety or not. Target Cash Position: A target that helps to determine the highest and the lowest amount of cash and cash equivalents of the organization. Cash Ratio: A sensitive liquidity ratio that measures the organization’s ability to pay its current liabilities quickly. Net Liquid Balance: A ratio that shows how the organization can meet its current liabilities. Cash Flow Budgeting: Itemization of the projected cash inflow and cash outflow of the organization for a certain period in order to understand the future cash position of an organization.